Mangos are the most important tropical fruit crop after bananas and plantains (FAO, 2011). The mango fruit is a large fleshy drupe, highly variable in size, shape, colour and taste, weighing up to 1 kg in some cultivars. There are more than 1000 mango cultivars. Green when unripe, after 3 to 6 months the fruit turns orange-reddish as it ripens. The fruit consists of a woody endocarp (pit), a resinous edible mesocarp (flesh) and a thick exocarp (peel). The majority of mango production is consumed fresh and about 1-2% of the production is processed to make products such as juices, nectars, concentrates, jams, jelly powders, fruit bars, flakes and dried fruits (Berardini et al., 2005; Jedele et al., 2003). Mango varieties too fibrous or too soft for fresh consumption can be used for juice making (Hui, 2007). Mango processing yields about 40-50% of by-products, which can be used to feed livestock (de la Cruz Medina et al., 2002; Sruamsiri et al., 2009). These by-products are also potential sources of pectins and phenolic compounds (antioxydants) (Berardini et al., 2005). The mango kernel contains 7-12% of an oil rich in stearic (24-57%) and oleic (34-56%) acids that can be fractionated to give an olein with excellent emollient properties and a stearin that is one of the few fats that can replace cocoa butter in chocolate in certain countries (including the European Union) (Gunstone, 2006; Schieber et al., 2001). Cull fruits: fresh fruits unsuitable for human consumption. Mango seeds (pits, stones): the seed represents from 20% to 60% of the whole fruit weight, depending on the mango variety. Ground mango seeds are also known as mango seed meal. Mango seed kernels (mango kernels): the kernel inside the seed represents from 45% to 75% of the whole seed (Maisuthisakul et al., 2009). Ground mango kernels are also known as mango kernel meal. Deoiled mango kernel meal (deoiled mango seed kernel meal) is the by-product of the extraction of mango oil from the kernels. This product contains only residual oil, unlike mango kernels or seeds. Mango peels: the peels represent from 7% to 24% of the whole fruit weight (Berardini et al., 2005). Mango waste: mango processing units yield mango wastes made of variable proportions of peels, pulp, seeds and cull fruits. Note: mango by-products are sometimes named incorrectly. Mango seeds are sometimes called kernels: the crude fibre or ADF content of actual mango kernels (dehulled seeds) should be lower than 5% DM. Mango seeds and kernels typically contain more than 10% DM of oil. A mango seed or kernel meal with a low oil content is a by-product of mango oil extraction. The mango tree originated from South-East Asia and is now widespread in tropical and subtropical areas between 30°N and 25°S, from sea level up to an altitude of 1200 m. Optimal growth conditions are average day temperatures ranging between 24 and 30°C, annual rainfall between 750 and 2500 mm with a marked dry period for fruit induction, full-sun exposure on deep, well-drained and poor soils with soil pH ranging from 5.5 to 7.5. Mango trees are tolerant of drought or flooding conditions. In the subtropics, they can survive frost but young shoots and flowers are killed at temperatures between 4° and 12°C. Fruit production will be hampered if frost comes late in the season. Mangos will not stand acidic or saline soils (Orwa et al., 2009; Sukonthasing et al., 1991). Mango production in 2010 was 39 million t (including mangosteens and guava). 80% of the world production came from India (40%), China (11%), Thailand, Pakistan, Mexico, Indonesia, Brazil, the Philippines, Bangladesh and Nigeria. Most mangoes are consumed locally and only 3% of the production is exported, the main exporters being India and Mexico. Due to the increasing popularity of the fruit in Europe and North America, mango production doubled between 1990 and 2009 and exports saw an eight-fold increase during that period (FAO, 2011; Jedele et al., 2003). Fresh mangoes spoil rapidly, and several methods for ensiling them have been proposed. In one method, immature fruits are sliced and ensiled with 1% salt in 1.5 m3 pits lined with large leaves. The pits are then tightly covered with leaves and soil (Göhl, 1982). In another method, mangoes are cut into 1.5 cm slices and ensiled for 30 days with maize stover, molasses and urea (Aguilera et al., 1997). Mango pits and mango kernels should be soaked and dried (down to 10% moisture) to remove tannins before being fed to livestock (Morton, 1987). Solid state fermentation with Aspergillus niger has been tested to increase the protein content of mango peels (de la Cruz Medina et al., 2002). It can be estimated that mango processing yields between 150,000 and 400,000 t of wastes worldwide, which may cause environmental problems in the vicinity of the processing plants. The use of mango wastes in livestock feeding is a way of reducing environmental concerns (Jedele et al., 2003; El-Kholy et al., 2008). The chemical composition of the by-products of mango processing is extremely variable: there are about 1000 mango varieties with different proportions of seeds, hulls, pulp, peels and sugar content. Moreover, mango by-products contain variable (and often unknown) amounts of fruit components. It is therefore difficult to provide accurate or even representative compositions for mango by-products. As a rule their protein content is generally low (less than 10% DM) or very low (less than 5% DM). 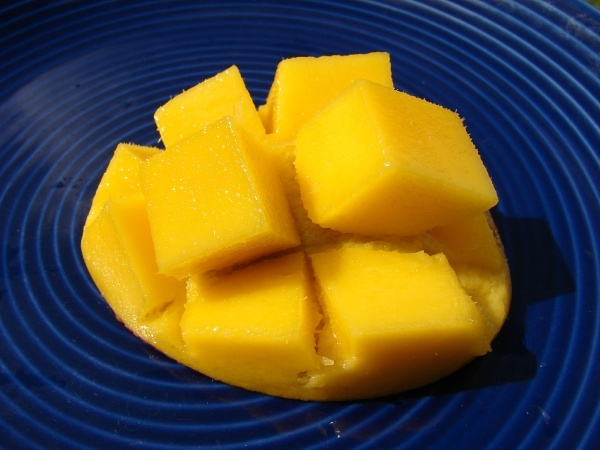 Unripe mango pulp contains starch that turns into sugar when the fruit ripens. The ripe pulp is rich in soluble sugars (70-90%), most of it fructose (60-67% of soluble sugars) (Kansci et al., 2008). The fibre content is highly dependent on the amount of seeds present in the product: the crude fibre content of peels and pulp ranges from 2 to 16% while mango waste from juice extraction (that contains peels, pulp, whole seeds and whole fruit) has ADF values over 20% DM. Mango seeds have a hard fibrous shell containing a kernel rich in oil (6-16% DM of the kernel) and starch (40-50%) (Medina et al., 2010). While the seeds are bulky with a high fibre content (more than 20%) (Ali et al., 1992), the kernels can be considered as a valuable energy feed, although low in protein (less than 10% DM) (de la Cruz Medina et al., 2002). The use of mango kernels has been successfully investigated in several animal species, but it is unclear whether they are used in practice. Mango kernels are fairly rich in tannins, which progressively lead to reduced growth rates and less efficient feed utilization when included as a major component in diets for pigs and poultry (Moore, 2004). They also contain cyanogenic glucosides (64 mg/kg DM), oxalates (42 mg/kg DM) and trypsin inhibitors (20 TIU/g DM) (Ravindran et al., 1996). Several treatments (soaking, boiling, HCl or NaOH treatment, autoclaving or HCl followed by Ca(OH)2) may remove tannins and HCN but the most effective method proved to be soaking as it removed 61% of the tannins and 84% of HCN (El Boushy et al., 2000). Like other fruits of similar size, mango fruits can be dangerous to cattle when swallowed whole, as they may lodge in the oesophagus, causing obstruction and subsequent meteorism (choke bloat) and heart attack (da Silva, 2008; Vishwanatha et al., 2012). Similar problems have been reported with mango seeds in buffaloes (Kumar et al., 2010). 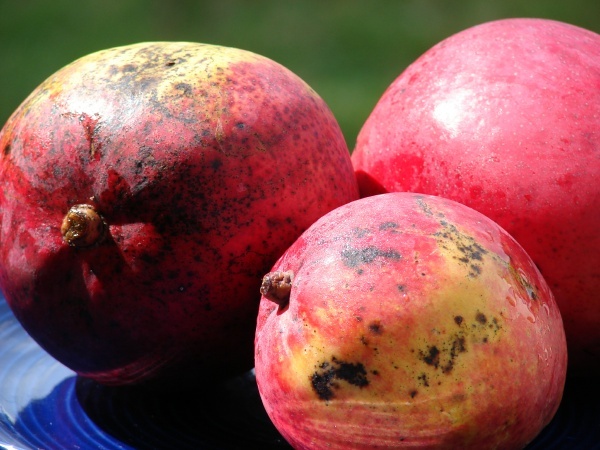 Cattle fed mangoes in excess or consuming fallen mangoes at the time of harvest can experience difficulties in rumination and dizziness, due to possible ethanol intoxication (Assis et al., 2010). Mango peels contain urushiol, a chemical that can cause contact dermatitis in susceptible people (Geller, 1989). Mango kernels contain oil and must be dried to prevent rancidity (de la Cruz Medina et al., 2002). Mangoes are palatable to ruminants, and cattle readily eat them when they fall to the ground (Göhl, 1982). 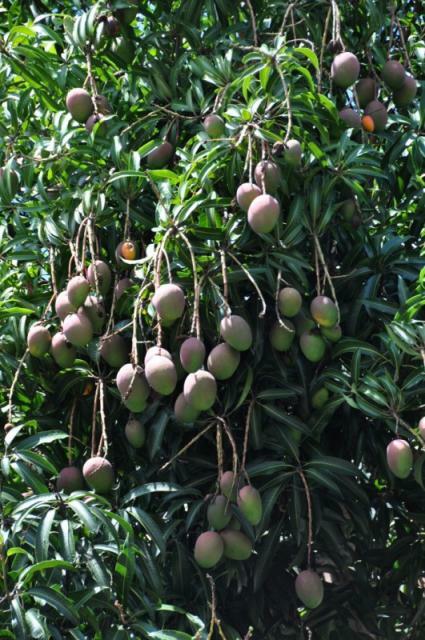 Mango seeds can be used fresh, dried or ensiled and ruminants can tolerate concentrates with up to 50% mango seed kernels without adverse effects (Göhl, 1982). In an experiment with sheep, DM digestibility of dried seed kernels was found to be 70% but intake was rather low (1.2% LW). The mango seed kernels showed low palatability probably due to the tannin content. When offered ad libitum to sheep, mango seed kernel intake varied. When mango seed kernels were fed alone, their intake represented up to 43% of the total intake, but when fed in combination with mango peels, their intake was as low as 7% of total intake. In both cases the diets could not sustain animal requirement for crude protein (Sanon et al., 2013). However, a limited amount of kernels (less than 10%) mixed with mango peels, rice straw and supplemented with urea would be able to sustain 50 g daily weight gain in sheep (20 kg LW) (Sanon et al., 2013; Sanon et al., 2010). Mango peels can be fed fresh, dried or ensiled. Due to their high sugar content, they are palatable to ruminants and can be considered as an energy feed, but the high moisture and acidity of fresh peels may limit their use. Because of their low protein content, the addition of a source of nitrogen or protein is necessary to allow an efficient utilisation of the energy in the diet. In order to produce good silage, mango peels have to be mixed with dry materials (straw for example) and a nitrogen source (a legume for example) to increase moisture and protein content to facilitate fermentation (Sruamsiri et al., 2009). In an experiment with sheep, DM digestibility of dried mango peels was found to be 74% and the mango peels intake reached 2% LW (Sanon et al., 2010). Lower DM digestibility values (less than 60%) have been registered for a mango peels/rice straw silage consumed by cattle, but nutrient digestibility increased with the inclusion of Leucaena leaves in the diet (Sruamsiri et al., 2009). The fresh by-product of mango juice extraction (mixture of peels, stones and cull fruits) was found to have a higher energy value than maize silage and could partly replace energy concentrates in diets for ruminants (Azevêdo et al., 2011). In sheep, supplementing elephant grass silage with increasing amounts (up to 16% of the DMI) of dried mango juice extraction by-product improved the chemical composition of the diet but not its nutritive value, as it reduced intake and the digestibility of some nutrients (Rêgo et al., 2010). A mixture of peels and seed kernels gave a higher intake than peels and kernels separately (Sanon et al., 2010). Mangoes are relished by pigs, but the kernels are not well used due to their high tannin content. Fruit silage may be useful for off-season pig feeding (Göhl, 1982). Dried mango peels included at 10% in finishing diets for pigs had no deleterious effects on feed conversion ratio or animal performance and were found to be cost effective feeds (Rao et al., 2003). The overall chemical composition of mango seed kernels make them suitable for poultry feeding, despite the presence of antinutritional factors. The metabolizable energy value is low in dried raw kernels (7.9 MJ/kg DM) but increased after boiling (up to 10.3 MJ/kg DM) (Ravindran et al., 1996). In broiler chicks, the inclusion of raw mango seed kernel meal usually reduces growth rate. Inclusion rates as low as 5 to 10% depressed growth and feed intake in some experiments (El-Alaily et al., 1976; Diarra et al., 2008; Teguia, 1995) while performance was maintained at 10% inclusion rate in another trial (Odunsi, 2005). In older animals, raw kernel meal were eaten more readily and growth rates were maintained (Diarra et al., 2008; Odunsi et al., 1997). The nutritive value of mango kernels was improved by boiling, which improved growth rate compared to untreated kernels (Diarra et al., 2008; Joseph et al., 1997). Boiling or autoclaving reduced antinutritional factors such as tannins and trypsin inhibitors (Farag, 2001). Soaking without boiling could also reduce antinutritional factors to some extent but was not efficient enough to support growth rates at the level of the control diet (without mango kernels) (Ravindran et al., 1996). The recommendation for optimum growth is to use, if possible, boiled mango seed kernels and to keep the inclusion rate below 5% in chicks and below 10% in older animals. However, in slower growing animals higher inclusion levels could be tested. The incorporation of 5% raw mango seed kernel meal in layers decreased egg laying rate and increased weight loss in layers (Odunsi, 2005). Residues from the mango juice industry contain kernels, peels and discarded fruits. This residue has a lower value in poultry than seed kernel alone because of its lower crude protein and fat content, and higher fibre content. Trials on broilers with diets balanced for protein and energy resulted in slightly depressed performance at 2.5% and 5% inclusion levels, with growth rate being increasingly reduced as the level of mango residue in the diet increased above 5% (Vieira et al., 2008). Mango fruits are commonly used as rabbit feed when available in small-scale rabbit production units of several African countries, including Uganda (Lukefahr, 1998). Local fresh mango fruits harvested at intermediate maturity stage could replace about 33% of a commercial diet without significantly hampering animal performance (Palma Castillo et al., 2009). It is preferable to make small cuts in the mango peel to make consumption easier by rabbits. Peel and pulp were entirely eaten while the kernel was completely cleaned by rabbits but remained uneaten. Though mango fruit is a palatable source of energy, its protein and fibre contents are very low, which may explain the lower growth rates observed when mango fruits replaced more than 33% of the commercial diet (Palma Castillo et al., 2009). Fresh mango peels were successfully fed to West African snails with no adverse effects, but reduced performance compared to papaya peels (Omole et al., 2004). de la Cruz Medina, J. ; Garcia, H. S., 2002. Mango: Postharvest operations. In: Mejia, D.; Lewis, B. InPho Post-Harvest Compendium. AGSI/FAO. Joseph, J. K. ; Abolaji, J., 1997. Effects of replacing maize with graded levels of cooked Nigerian mango-seed kernels (Mangifera indica) on the performance, carcass yield and meat quality of broiler chickens. Bioresource Technol., 61 (1): 99-102.